The Presurfer: What Kind Of Penguin Are You? Yesterday was World Penguin Day. Yeah, I didn't know that either. Anyway, it was World Penguin Day, that day of the year when we all pause to reflect on how great penguins are. Or something. Here, just for the fun of it, is this entirely unscientific test to determine precisely what kind of penguin you are (in a metaphorical sense, as I'm aware that you're probably not literally a penguin). 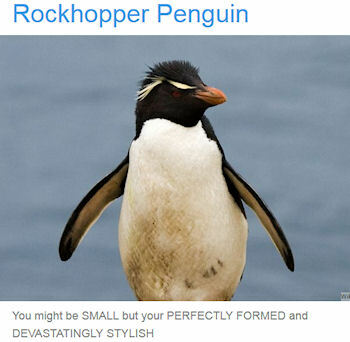 I'm a Rockhopper Penguin.